Calisse & Steve - engaged! Images of the wedding albums available and how they compare to each other, and a full set of swatches. 10x10 ArtBook shown in Chiara leather with 6x6 image cutout and three 6x6 PhotoBook minis duplicate albums with image wrap cover for the parents and grandparents. 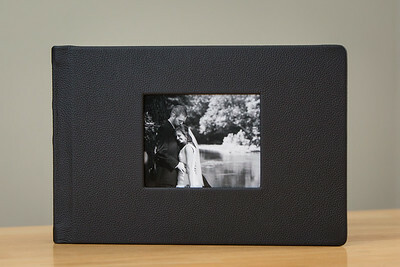 Wedding Albums - ArtBook - Shown in 8x12 with Black leather cover and image cut out, the ArtBook features lay flat pages and seamless printing on thick, sturdy pages and over 50 leather cover options ranging from solid black to funky patterns. Albums are hand made in the USA. 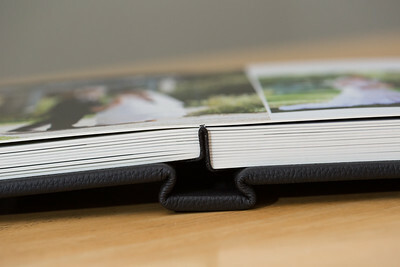 Wedding Albums - the ArtBook features lay flat pages and seamless printing on thick, sturdy pages and over 50 leather cover options ranging from solid black to funky patterns. Albums are hand made in the USA. 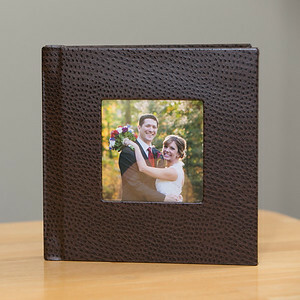 Wedding Album - PhotoBook - Shown here as an 8x8 parent album with "Fox Downs" fabric and image cutout. 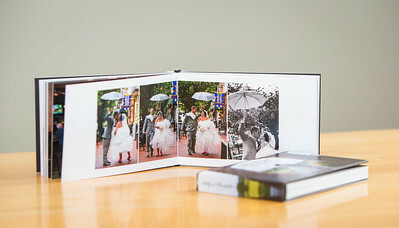 Wedding Albums - the PhotoBook features lay flat pages and seamless printing on thinner pages. Albums are hand made in the USA. 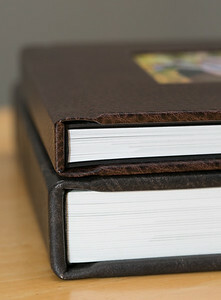 Here an 8x12 Artbook with Black leather and image cutout is shown with duplicate PhotoBook parent album, 6x9 with image wrap cover. 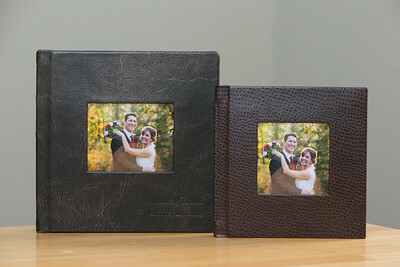 Wedding Albums - 10x10 Artbook shown with Biker Chic leather, 4x5 image cutout, and names and date branded on the cover. 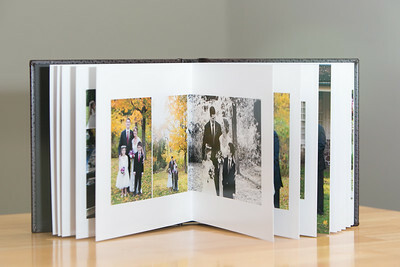 Matching 8x8 PhotoBook parent album shown with Fox Downs fabric cover and 4x4 image cutout. Comparing the ArtBook (bottom) to the PhotoBook (top), the ArtBook has substantially thicker pages but the image quality is the same. 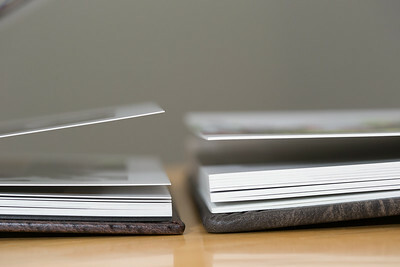 Comparing the ArtBook (right) to the PhotoBook (left), the ArtBook has substantially thicker pages, but the image quality is the same. 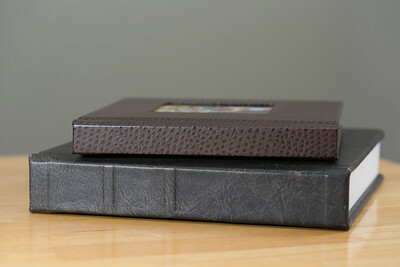 PhotoBook minis are small PhotoBooks that are ONLY available in quanities of three or more when ordered with an ArtBook. 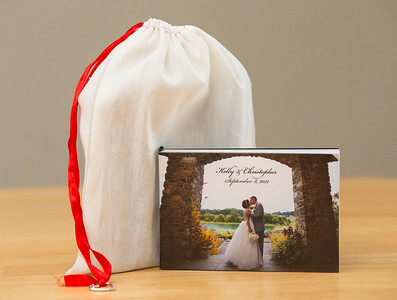 They are available in 4x6 or 6x6 with image wrap or paper covers and each mini comes in it's own fabric drawstring pouch. 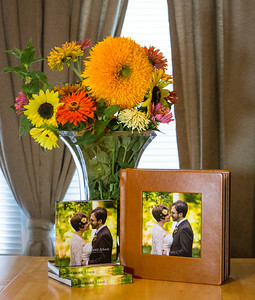 the 8x8 hard cover signing book is perfect for your engagement images. 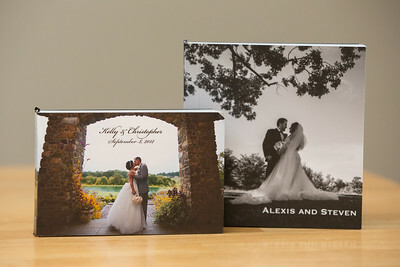 Photos are laid out with ample white space around them for guests to sign the pages at your wedding. Includes photo-safe pen. All images copyright Crissy Everhart Photography. Do not edit or duplicate.